This is my entry for this week's Passion for Promarkers challenge - I'm steadily working my way through Christmas cards at the moment!! I bought Sugar Nellie's lovely Miss Clause stamp the other day and stamped it up 20 times - I've coloured half in red and green and the other half in blues, so there may be another card coming soon in the other colour scheme!! I followed the Passion for Promarkers blog sketch. Almond and Caramel are the only two of the new colours I've bought so far and I'm loving them!!! The blue snowflakes are cut with a Cuttlebug die. The white snowflakes are a Dovecraft punch. All highlighted with Glitz It Ice Blue glitter glue ( I love that about doing Christmas cards!!!). This is today's second card and this one is for two challenges. I have followed the sketch on the Truly Scrumptious blog. The other rule with this challenge was to use at least three different stamps, not including the sentiment. I have used these lovely Woodland Elements stamps from Woodware because they fitted in really well with the other challenge I was doing - the Creative Inspirations blog asked for an Autumn themed card. The images were stamped in black Memento ink and then coloured with my promarkers. The frame was cut with my nestabilities - I've just got a great magnetic mat from Joanna Sheen and it makes cutting frames so much easier!!! This is the first of two cards I have for you today. It is for the challenge on the Moving Along with the Times blog. There was a sketch to follow and also a theme, which was 'Strictly Sparkling'. My Forever Friends bear has been stamped in Memento Grape Jelly ink and then coloured with my promarkers. To stick with the sparkling theme I have used lots of silver card in my matting, together with lilac handmade paper, and then spritzed it with Cosmic Shimmer Mist in Silver. The actual card is now quite sparkly but it doesn't show up very well on the photo!!! This is my take on this week's sketch challenge over on the Stampin' Chic blog. I wanted to use my elephant stamp (which I had previously stamped onto white vellum, using stazon). I thought the pattern on the elephant would go well with these papers, from the Clare Curd Signature Range. Although now I look at it on here I'm thinking maybe you can have too much of a good thing and I should have left the white layer unpatterned!!! I coloured the image with promarkers, cut it out, stuck it on silver card and then cut it out again. The shapes are all cut with my nestabilities. The sentiment stamp I've used again is the freebie from one of the recent DoCrafts magazines. The ribbon is from the new Papermania couture ribbon collection and I've also used Papermania scalloped card blanks (yes, I do use quite a lot of their stuff!!!). This card is for the Moving Along with the Times challenge blog. I have followed the sketch on the blog and also the theme which was 'Birthdays'. I have used my Daisy stamp (from Papermania), coloured with promarkers. 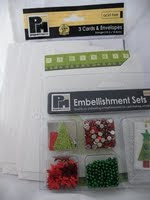 The background papers and ribbon are also Papermania. I can't remember where the flower came from!! Well, I hope you haven't suffered too much from the wind we had last night!! We had things blown around all over the place here. My girls have (or rather, had!!) a wooden castle in the garden which ended up in pieces up the lawn. Not good!! Oh well, on to cards...!! This is my card for the current Sugar Bowl sketch challenge. The challenge was also to use the colours pink and brown. I made this for my mother-in-law's birthday which is today - Happy Birthday Ann if you're reading this!! The image is one of the Gorjus girls and I have coloured it with my promarkers. The pink circle has been embossed with the Swiss Dots cuttlebug embossing folder and then I highlighted over the top with beige Papermania shimmer chalks. All the edges have been inked with Colourbox fluid chalk in Chestnut Roan. The 'Just for you' stamp was a freebie on one of the latest Creativity magazines. I stamped it with the same fluid chalk. 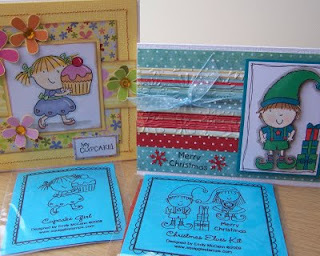 The papers are from the Clare Curd Signature Range Big One paper pack. Brads and ribbon both Papermania. Paper flowers from my local craft shop (and the home of Sugar Nellie!!). I hope you all had a good weekend! We've had a lovely day at Landmark today (an adventure park near Aviemore). The girls had an excellent time climbing on all the things, now that the summer queues have died down!! This evening I have a card that is for two challenges. I made this for one of my daughter's friends from her ballet class. Firstly, I have used the sketch from the Mojo Monday blog. The ballerina girl image is called 'Elise prepares'. I downloaded it from the website Sketching Stamper digi-stamps. I printed it off and coloured it in with my promarkers. The circles are all cut with my nestabilites. I have added faux stitching around the edges for this week's challenge on Papertake Weekly which is 'faking it'!! The background papers are Papermania. I have then sprayed some of them with Cosmic Shimmer Mist in Rich Gold. It is the first time I have used these sprays and I am not entirely happy with the effect - will need to practice!! The chipboard numbers and dots were from Papermania. I have painted them with Anita's metallic black acrylic paint. When dry I covered this in Stickles glitter glue. Well, I think that's about it! Thanks for looking! !